Which Toothpaste Type is Best for You? From a young age, we are taught that it is vital to brush our teeth at least twice a day, once after breakfast and once just before going to bed at night. At first, all toothpastes will feel and taste the same, but after a while we discover that there are certain differences from one to another. For instance, you might see one tube at home that’s branded as ‘whitening’, while another is billed as ‘desensitizing’. The different types of toothpaste perform various functions and while one type could be perfect for you, another might not suit at all, depending on the nature of your teeth. If you have quite sensitive teeth, then it’s best to use desensitizing toothpaste and avoid a whitening one, as the latter is rather strong and contains a lot of abrasive agents. The experts at Dervla Leavy Dental Care put together this useful infographic which outlines all the main toothpaste types, explaining their qualities and indicating for whom they would be most appropriate. 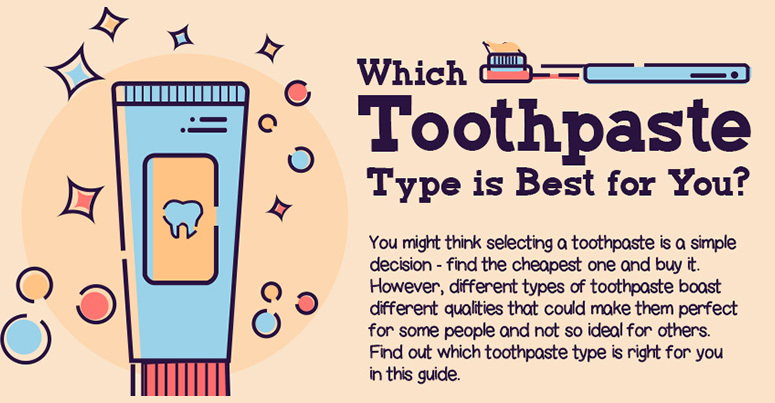 Find out below which type of toothpaste is best suited to you.